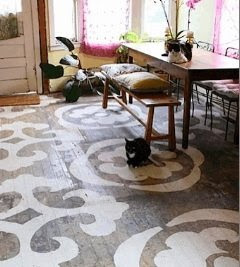 Our floors are gorgeous, but the entire house (seriously. The entire house. Ceiling, walls, floors, moulding, gah.) 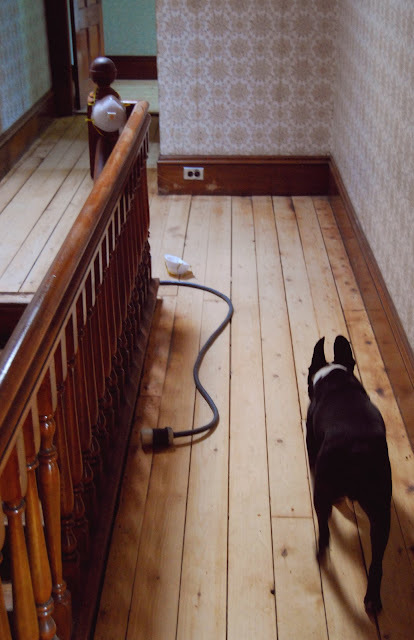 is covered with a fine pesky layer of floor refinishing dust. Oh, I'd HEARD about tack cloth before. Sure. Who hasn't HEARD of tack cloths? But I've never USED a tack cloth until now. Oh Tack Cloth. How I love you so. Thank you for your tacky goodness. I am very interested in hearing about and posting others' Holyoke renovation stories. 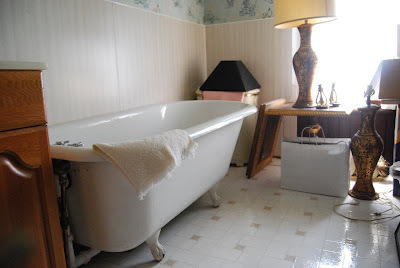 If you read this blog, live in Holyoke, and are interested in posting before and after pictures from a renovation project you worked on, please e-mail me at: holyokehomeblog at gmail dot com! 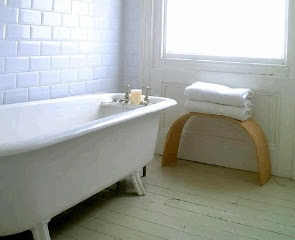 The other half of the bathroom showed a lovely wide beadboard and chair rail. Lovely, albeit stained a very dark brown. We cried, 'Why oh why did they remove half the beadboard?! Now we'll have to try to match it. Ugh.' BUT.....they didn't remove it! They covered it with vinyl panels. So now we only have to match the chair rail. Oh. And somehow remove evil clumps of adhesive and repair plaster and lathe walls. But STILL! Picking off the adhesive looked like fun, so using some elbow grease and a 4" stiff putty knife, I attempted to remove it. 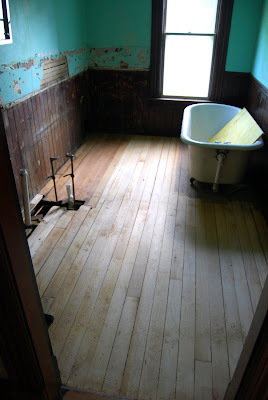 Most of it came off pretty easily, although I scraped my knuckles and put some 'dings' in the soft pine beadboard. Next, I'll sand the beadboard and it will be ready to prime and paint a glossy white. We installed a new (to us) washer and dryer in the basement and found this helpful guide tied to the exhaust vent. Is that Pebbles on the cover? Oooooooh! What a Zen-like 'Service Doctor.' May I call you Dr. Service? Nice shirt Dr. Service. 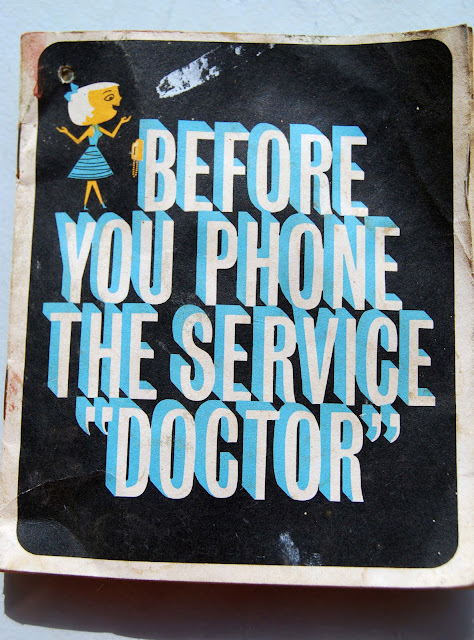 Dr. Service says, "Ah. Grasshoppah. 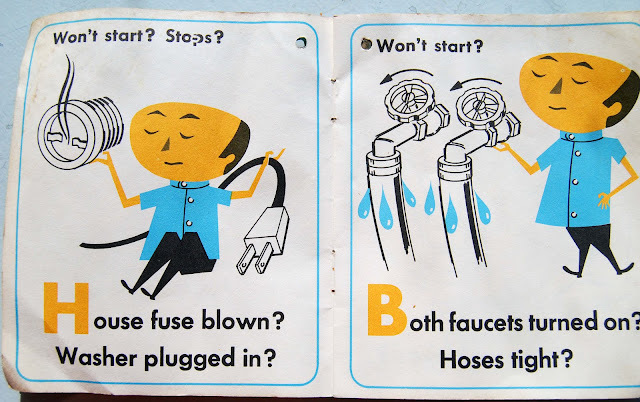 If you can take this fuse from my hand, your washer/dryer training will be complete." Do not cry, sad sad washer! 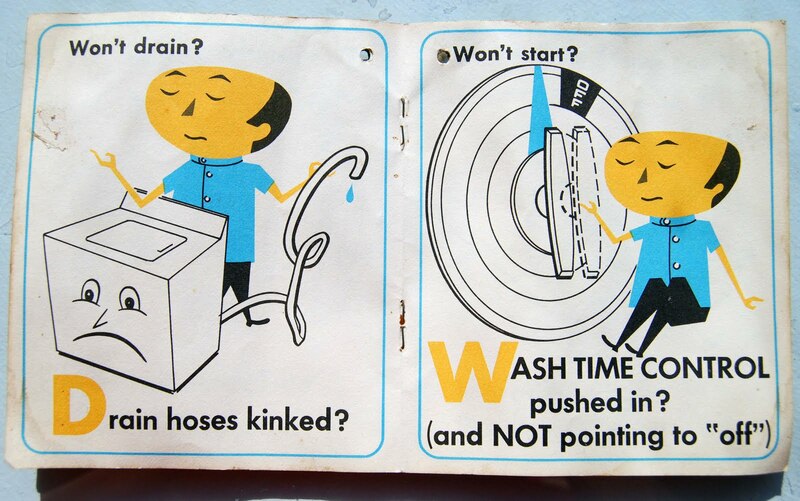 I will un-kink your drain hoses just as Dr. Service has shown me! 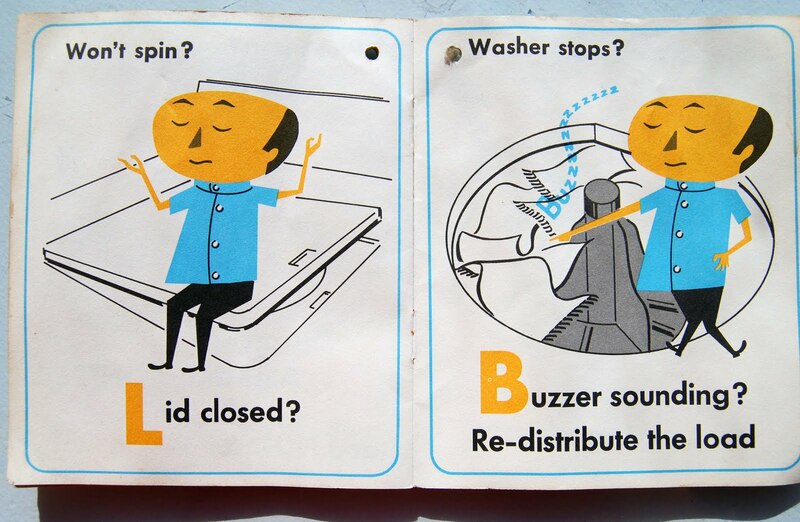 I thought only women sat on washer lids while looking blissed-out. Apparently Dr. Service knows more than his fashion sense lets on. If you ever found items left behind by a previous owner/tenant, tell me about it in a comment! My friends are really talented (Click on the image above for a more detailed view.) 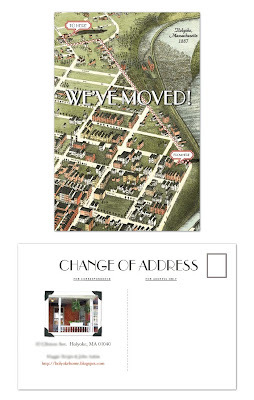 My dear friend from college, Susie Roselle, designed this change of address card for us. Isn't it TOO COOL?! Thanks Susie! The image is taken from a 1877 map of Holyoke. The entire map (we only used a small section) is available electronically on the Library of Congress' website. 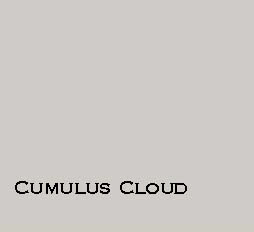 WARNING: it is an enormous file in a weird format (jpg 2000?) that made my computer act like it had just polished off an apple-tini or two. To get the map, go to this Library of Congress page, and type 'Holyoke, Massachusetts' into the query box. Your query will bring up two really cool maps of Holyoke, one from 1877, and one from 1881. I poured over the 1877 map for about two hours. It is that detailed. I noticed, for example, that Wistariahurst is there on Beech Street, but there are no other houses for blocks. And the entrance is on Pine St, before Belle had the Beech Street porte cochere (sp?) installed. If you look at the large map, I'd love to know what you noticed. 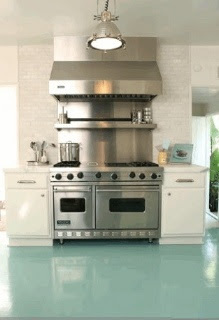 We've chosen our kitchen and bathroom floor colors. 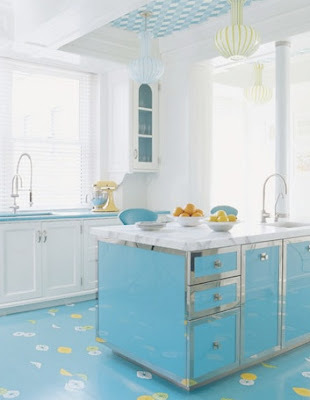 They are both Benjamin Moore oil-based floor paint from Clark Paint. I cannot recommend Clark Paint enough. I adore them (hi Dave and Andy!) They are nice, easy going but happy to help, and most importantly (ahem) they don't mind if you sit on their floor looking at different colors and sighing deeply for 2-3 hours. They also don't judge people (ahem) who order MANY pint-sized color samples (they're only $7 each!) Clark Paint has Benjamin Moore, Pittsburgh, and for the fancy-pants out there (ahem?) Pratt and Lambert. It takes me 10 minutes to get there from Holyoke. I take 391S to 91, then Exit 7, then right over the Memorial Bridge. At the rotary, take the second exit onto Memorial Ave., as if you are going to the Big E, then take your second right onto Union St. They are the second building on the left. And our bathroom floor color. I'm thinking about painting, in white, a huge free-hand cherry blossom motif on top of this. Like a giant stencil, but less cheesy? Or should I just leave it as is? Baseboard and wainscoting will be white. 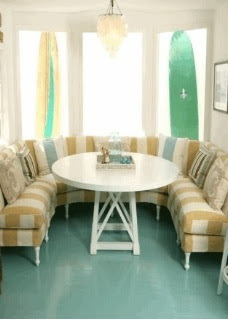 Do you have any suggestions about painting floors? How many coats? Should I apply a sealer on top? Do I need a special kind of roller or brush? Any thoughts or suggestions are greatly appreciated! Perhaps M'Lady Would Like a Xanax? Okay. I may have overreacted. A few trusted advisers are telling me I may have overreacted. The floors look good. If you need a 'floor' recap, click here. In follow-up to our request, over the weekend, Dion (our floor guy! Can't recommend him highly enough!) came out and sanded down a closet, removing the oil based sanding sealer. He then applied the water-based poly. In another closet, he put the first coat of water-based poly over the oil-based sanding sealer. And while the first closet floor was a little more blond, it really didn't look that different from the floors finished with the oil-based poly. If anything, the 'blond' color served to highlight the knots in the knotty pine. In addition to just spending time with the floors and getting used to them, I've been thinking: the floors are what they are. My brain imagined they would look like the refinished maple floors at Open Square. But this row house is not a mill that needed hard wood to bear all the machinery. Nor is this is a federalist era row house in Boston or Philadelphia. This row house was built for a working class family employed by the Holyoke's paper mills. The floors are pine. I've decided to relax and enjoy my amber pine floors. Dion came out this morning to buff the sanding sealer and apply the first coat (three total) of water-based poly. I took a peek this afternoon and they look gorgeous. When they are totally finished later this week, I'll post some 'before and after' images. I've been asking everyone I meet to analyze the cost/time/outcome benefits of removing wallpaper vs. skim coating over the wallpaper with wallboard compound. I've had lots of conversations that go like this: "Hi! Nice to meet you! Do you think we should rent a wallpaper steamer-offer? Or should we just go over the stuff with wallboard compound, then apply oil-based sealer and THEN paint?" "Um. What? No. Seriously. What?" "Fabric softener. It works pretty well on wallpaper." 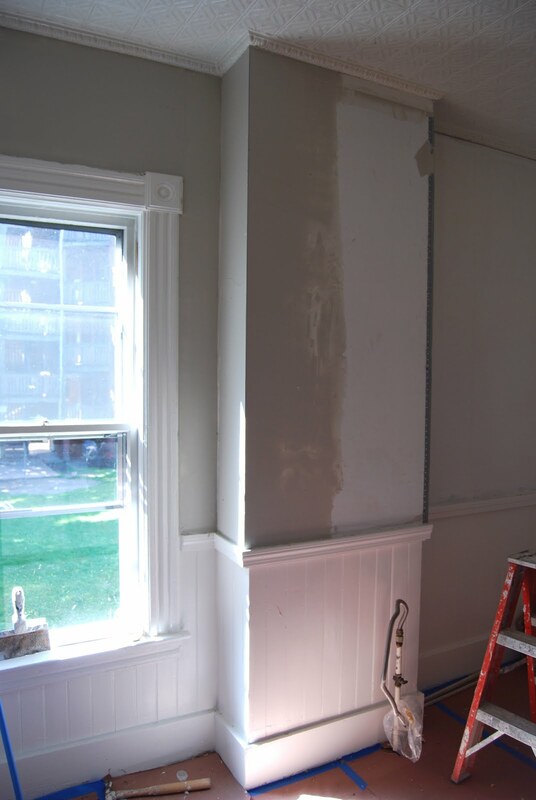 "I have plaster and lath walls too ; tried painting over my wallpaper, but it doesn't look that great." 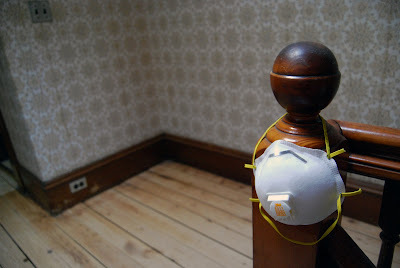 "Fabric softener works well on OLD wall paper, but DIF is a great product that you spray on in combination with a "paper tiger" which perforates the paper allowing the enzymes in DIF to be scraped off. It will be a big job, but that works best from my experience." "Warning: Walls will not be smooth once paper is removed. Lots of water loosens the paper from the wall or the lower layer of paper. It might be worth it just to have a pro plaster over the paper instead of stripping first. You should only gain 1/4 of an inch of wall. 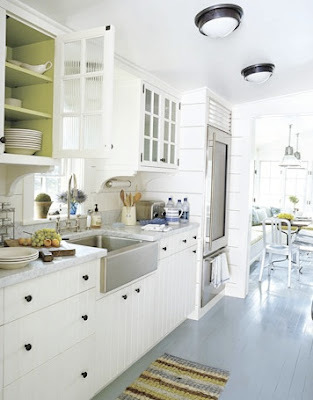 Molding and trim will still stand out. If I was close, you know I would come help. Good luck." "Liquor store is good for recovering from wallpaper removal. Oh, and I agree with the fabric softener--it worked for us." "I did mine. Three layers that had been there for 30 years. I forget the name of the product but you can buy it at [big orange store.] 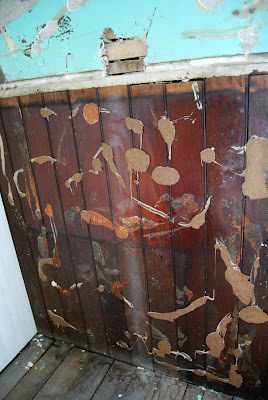 You mix it with hot water and soak the walls after you use a wheel to put holes in paper so it penetrates the wallpaper. The easier way is to hire someone to do it. " "Ah, wallpaper removal. Best trick I have found is to get a pump sprayer ( the kind you would use to spray for bugs outside) and then mix a solution of water and vinegar - 8--9 parts warm water to 1-2 parts vinegar. Totally saturate the paper and then use a scraper to remove the paper. I found that the older the paper, the better this worked. Trick was to use the pump to save your hands from a little spray bottle and to let it soak a bit to work on the glue. You might want to use a rubber scrapper if you're concerned about chipping the plaster on the walls. 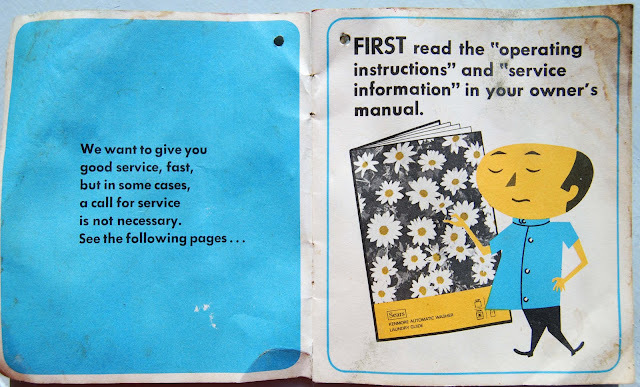 "Personally, I found this worked better than the expensive products and if it was old enough to be paper (and not vinyl-ish) that I didn't need to poke holes - which helped it tear off in sheets. Best of luck!" Do you have any thoughts about removing old wallpaper vs. skim coating over it? 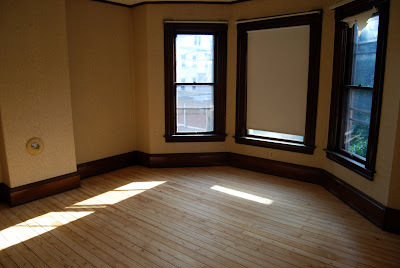 So, Dion came out and, over three days, sanded down all our floors. They really looked great. The cat urine stains all came out, and we discovered fir in the kitchen and bathroom and pine everywhere else. Then I got on my hands and knees and vacuumed up all the crap between the floor boards. They looked good! Rustic, but good. And then Dion did exactly as we asked and applied an oil based polyurethane coat. 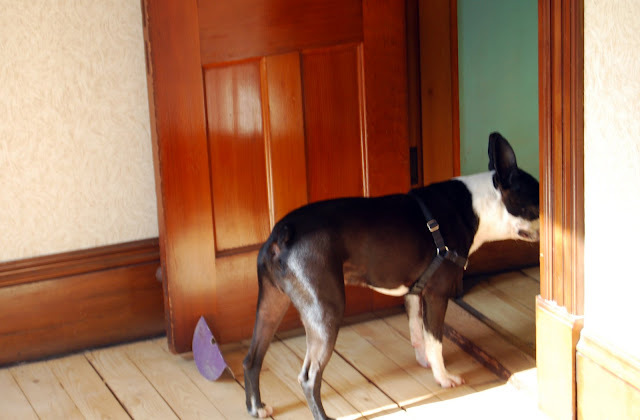 And then we realized we have KNOTTY pine floors. And now they were stained to really bring out the knotty-ness of their knots. I had teenage 'rec room' flashbacks and felt sick. The point of the oil based sanding sealer was to 'amber up' the floor. But because it's knotty pine, the effect is much like the photo below. A house we hoped to make modern now looks country kitchen. We paced the house and walked the halls and paced some more. We decided we want to see what the floor would look like WITHOUT the oil based sanding sealer, with just the non 'ambering' water based sealer (three coats in total). According to Dion, the water based poly will still color over time, but not as much, and over time. Dion - bless him - is going to come out and sand up one of our closets and apply the water-based polyurethane, so we can see what it would look like WITHOUT the oil based sanding sealer. Then we'll decide what to do. This potential extra sanding? Um. Not in the budget. Le sigh. I admit it. I was incredulous. 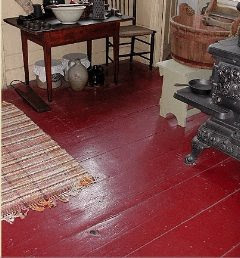 I did not believe the floors of the row house would "clean up great." I did not join the "these are going to look awesome" parade. Instead, I obsessed about gaps in floorboards and cat pee stains. But then the floor guys came. And it was just what I needed. These are the floors after sanding and before any varnish. This is Morgan. 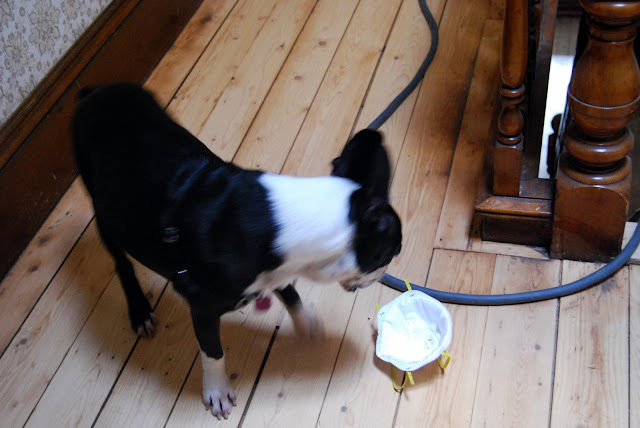 He's a 6(ish) year old Boston terrier. Morgan loves his new house. There are lots of places to explore and stairs to run up and down. 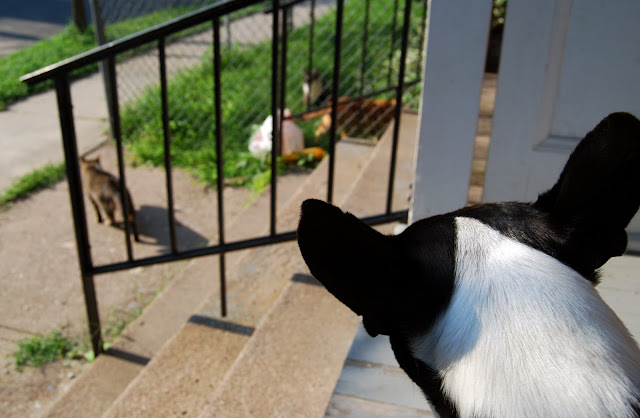 He's not so sure about the neighbors.